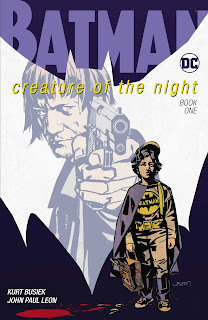 The issue opens and we are quickly introduced to Bruce Wainwright, a young boy obsessed with Batman. I know that "obsessed" makes it seem unhealthy and scary and the fact is, it may just be. However, at the start, I had a smile on my face seeing young Bruce find parallels in his world to the one of the Dark Knight. 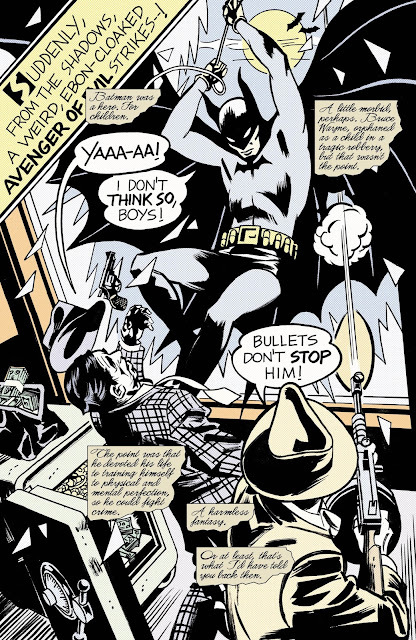 One of those parallels is his Uncle, Alfred, who co-narrates the book with Bruce. Alfred's bits keep the story grounded in reality a bit more than Bruce's, but along with his young great nephew's, don' necessarily make him out to be a great guy. Still, after what happens, he is the only family Bruce has left. Sound familiar? Yes...unfortunately so. You see, the story takes a dark turn when Bruce's parents are murdered in a botched robbery and from then on out, Kurt Busiek and John Paul Leon take you on a journey of the mind, imagination and more...maybe. Again, it's all about the parallels and they are laid out for the reader. 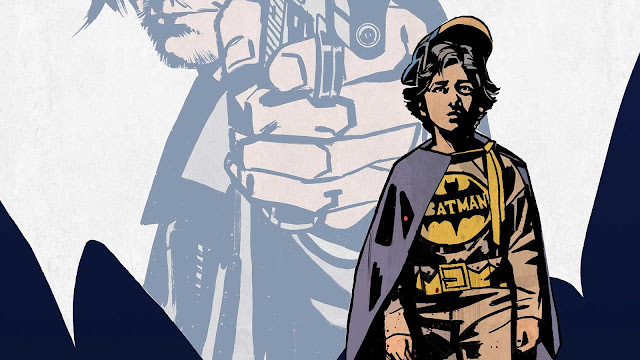 As the story unfolds, we get an alt version of "I shall become a bat", but it's more than just waging a war on crime here, it's a young boy trying to get through life when there is nobody to talk to. We get a training sequence, but it's forced upon him by adults who don't know what to do with him. And we get the Dark Knight, but at first it seems like it's a little boy's fractured mind trying to even the score, even it it's just in his head. By the end, however, it is more than that. While it's hard to pin down exactly what's going on just yet, the bad guys are defeated, the city fears the Bat and...it's still not enough for a little boy who lost the two people he loved the most. That's going to take more time and possibly some more cracked in skulls of bad guys who deserve it. I really liked this book. It feels a little more than "just a comic", but is so steeped in comic book lore and conventions that it wraps around to proudly be "just a comic". I actually think it reads good enough as a one-shot story which is a testament to Busiek, but I am so glad we are getting more. 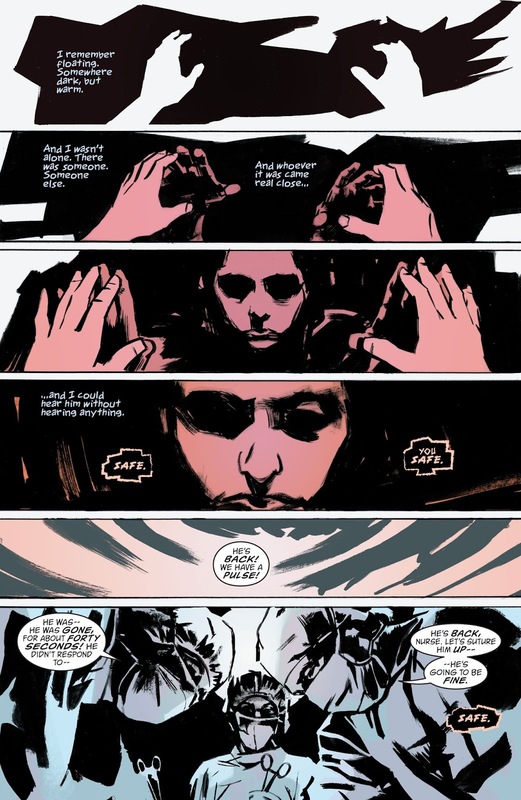 John Paul Leon's art fits the story so well and the whole package just feels important. My only real gripe is the cursive writing used for Alfred was hard to read at times and I don't have Eric Shea's vision problems. This is a really good story that is more than your standard comic book while celebrating comics in a dark and different way. Kurt Busiek and John Paul Leon give their character his biggest wish come true while also begging him to be careful what he wishes for. I feel so bad for Bruce, but I can't wait to see what happens next. The art in this book is stunning. The images of the leaves that suddenly look like bats when you stare at them is great. The dialogue boxes that scream “he’s using the bat-voice” without having to have someone comment on that was a great touch. Boston looks like the city I’ve visited. It’s really great. The story is equally well written. It feels like Bruce isn’t telling the whole story, but like you said, I still feel totally empathetic for the kid. Alfred’s allusions to doom in the first few pages have me questioning what’s going on and looking forward to the next issue. The psychologist (Leslie) doubting Bruce is telling the truth about the bat room and the police man (Gordon) admitting how much effort is being made to solve the murders felt very realistic. I usually don’t like Elseworld stories. I usually don’t like retelling of Batman’s origin. I loved this book.